At York Bridge™, we believe that premium materials are vital to a well-built, durable structure. We offer a wide array of types, sizes, cuts and grades to customize timber bridges, adding to the beauty and versatility of your design. Each York Bridge™ uses timber treatments that extend the life of the timbers by providing protection from insects or fungi. These treatments extend the life of wood to well over 50 years minimizing the need for repairs or replacement. Used for its high density, Southern Pine has the highest specific gravity of all common structural lumber species, providing superior fastener-holding power and load-bearing capacity. See our projects built with Southern Yellow Pine. Often our standard used in the Western United States where this species is most commonly found. It is also tight knotted and close grained, adding the bonus of beauty to its structural capabilities. See our projects built with Douglas Fir. Glued laminated timber, also called Glulam, is a type of structural timber product comprising a number of layers of dimensional timber, bonded together with durable, moisture-resistant, structural adhesives. See bridge projects with glulam stringers. Glasswood Lumber — YBC’s most environmentally-friendly option. Hardwood timbers, such as South American IPE. Green heart piling in lieu of treated piles. Composite and/or recycled decking and railing material. Rough sawn timbers in lieu of smooth or planed wood. Every connection is important in the prevention of twisting and warping. We use the highest quality fasteners available to provide a well-built structure that will last. Protects the bridge from damage or marks during the construction of the bridge(s). Protects the wetlands from oils or fluids from the equipment during the construction of the bridge(s). Recommended for boardwalks, when using composite materials and on any bridge greater than 200? in length. Recommended for vehicular bridges that will be constructed during the building of a development. 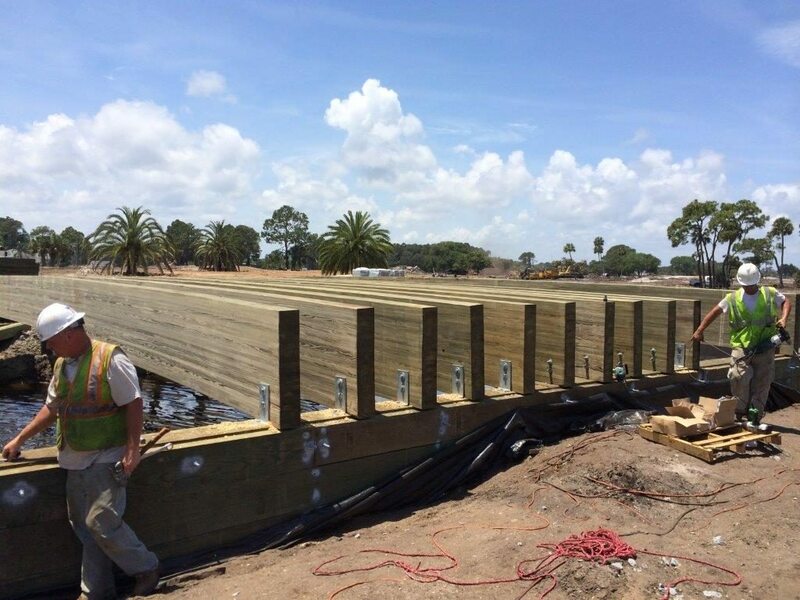 York Timber Protective Systems™ assist in timber bridge longevity and are recommended on ALL timber structures. Top-rated in grade pressure treated southern yellow pine — standard on nearly all parts of the bridge. Southern Pine is an abundant and renewable resource, growing in a vast band across the Southern United States from East Texas to Virginia. These forests are in close proximity to hundreds of Southern Pine lumber manufacturing facilities, offering ready availability to major markets. Southern Pine has long been the preferred species for pressure treatment because of its unique cellular structure that permits deep, uniform penetration of preservatives. Some 85% of all pressure-treated wood produced in the U.S. is Southern Pine. Performs exceptionally well in humid climates. Southern Pine forests are some of the most productive and sustainable timberlands in the world, capturing large amounts of carbon from the air and storing it in lumber used every day. Southern Pine is grown and manufactured in the U.S. South, further improving local economies, reducing transportation costs and minimizing impacts on the environment. 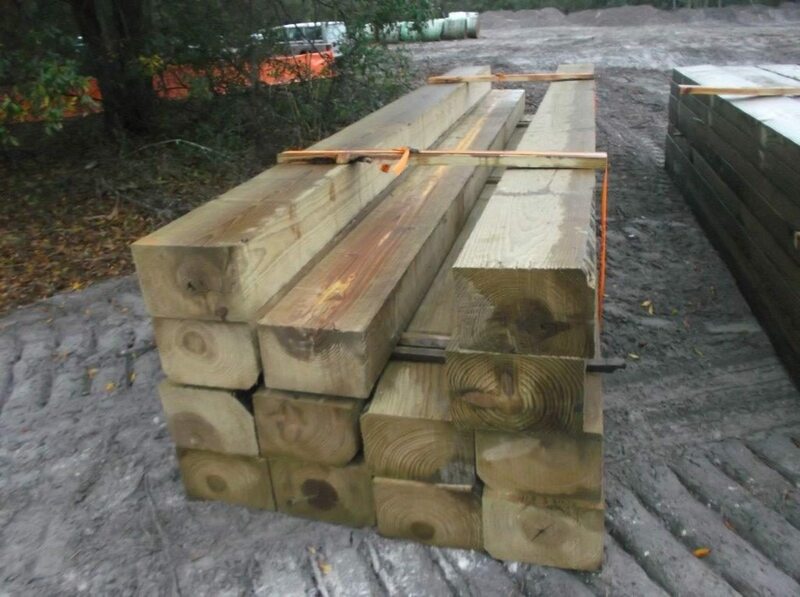 Top-rated in grade pressure treated Douglas Fir — standard on nearly all parts of the bridge. Often our standard used in the Western United States where this species is most commonly found. Superior strength combined with a exceptional strength-to-weight ratio, high specific gravity (for excellent nail and metal truss plate-holding capability) and excellent dimensional stability (giving “green” DF products the ability to season well in service). Documented excellent performance record against strong forces resulting from winds, storms and earthquakes. It is also tight knotted and close grained, adding the bonus of beauty to its structural capabilities. Density of this material is an additional defense to warping, twisting and cupping, especially in dry climates. Can have a rustic appeal which lends to the overall look of the bridge. Glued laminated timber, also called Glulam, is a type of structural timber product comprising a number of layers of dimensional timber, bonded together with durable, moisture-resistant, structural adhesives. Glulam beams optimize the structural values of a renewable resource — wood. Douglas fir or southern yellow pine wood can be used. Penta and or CCA treatments are standard — other treatments available. Can be used for the primary stringers of a bridge to span up to 100’ or more. The process of using treated lumber with glue at every laminate connection provides superior longevity. 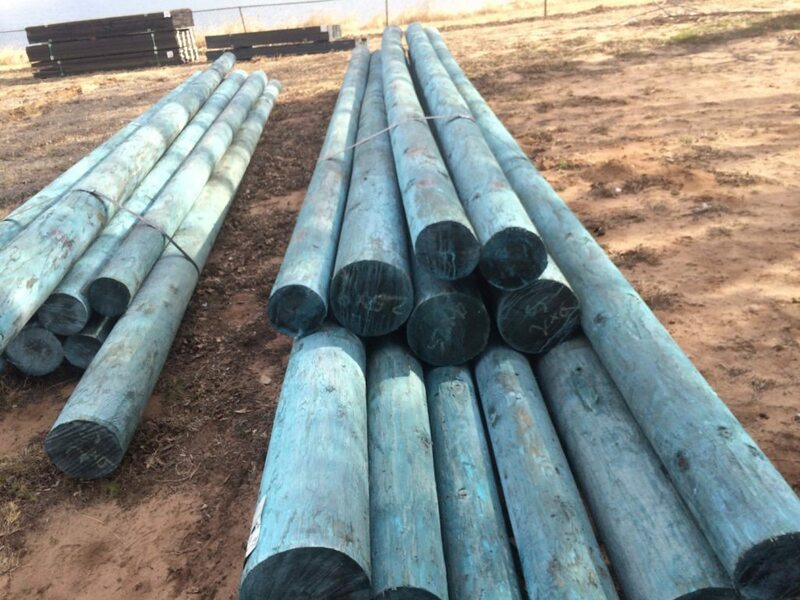 Can be used in hand rails and other bridge applications. Pound for pound, glulam is stronger than steel and has greater strength and stiffness than comparably sized dimensional lumber. It takes two to three times more energy and six to twelve times more fossil fuels to manufacture steel or concrete beams than it does to manufacture glulam beams. The life cycle greenhouse gas emission is lower for glulam beams than steal or concrete beams. If glulams are burned at the end of their service life, more energy can be recovered than was used to manufacture them. The cost of the glulam beams is slightly lower than the steel or concrete beams.